Problems encountered while accessing your home when you are wheelchair bound generally begin before or at the front door. If you can reach the front porch approach without obstruction then you have a great start since the stairs leading onto the front porch can be another matter all together. A correctly designed ramp having a 1:12 slope can adequately solve this problem. The use of grab bars and any railings will be dictated by the ramp's design and the regulations and physical limitations involved. Once your safely upon the porch, your home's front door width can become an issue. Any entry door less than three feet in width will cause a problem in maintaining a required 32 inch clear entry way which starts the new accessible route within your home. Rolling over any vertical threshold height greater than 1/2" is also difficult to maneuver. Once inside the structure a new set of problems concerning your accessibility will be discovered. A traditional home builder has never truly considered the special needs of the disabled or aging within any home design. Unfortunately the design emphasis is always put on aesthetics and takes for granted everyone's mobility. There certainly are no guarantees or clauses within any home's sales contract that will prevent our future personal life experiences from introducing us to at least a temporary disability. Accidents will always happen and you could find yourself having to utilize a wheelchair or walker to facilitate your independence for mobility. Limitations in our mobility or constantly changing needs experienced by both the disabled and the elderly have sprung a new dimension in construction known as ADA remodeling to accomplish increased accessibility. Our homes have always been exempt from any and all of the accessibility regulations that have been put in place since 1968 when our Viet Nam veterans were returning home. The new evolving concept known as Universal Design for home remodeling is catching on nation wide and has been for several years as a sign of the times. Universal design techniques used in building makes a home more accessible to all regardless of their mobility or adaptive abilities. An evolution of new products used for disability home modifications is making those homes more accessible and has finally come about in the remodeling industry. These new advances in accessible home remodeling in Austin not only keep the living environments safer but will not compromise the home's aesthetics. An accessible bathroom for the user's convenience and safety becomes the first issue for anyone using a wheelchair or walker for either a short time while recovering or for the rest of their life. The disability access bathroom will be located within the home's accessible route. Any architectural barriers encountered while approaching the bathroom entrance will need to be removed. The minimum clear widths have to be observed. This will include the bathroom door itself. Twenty four to twenty eight inch wide doors are commonly used during the construction of American homes for accessing the bathroom. However, anything below three feet does not meet the 32 inch required clear width needed for clearance of a wheelchair. This work may involve framing alterations and moving light switches. The electrical changes should be done by a licensed electrician assuring your safety. A completely serviceable special needs bathroom must contain at least one ADA vanity and the accessible route must be defined. The vanity must be one with a clear underneath scald protected area having an unobstructed roll under capability for wheelchairs. These new residential vanities do not need to look institutional. They can be designed like any other piece of fine furniture. A five foot turning radius allowing the wheelchair to maneuver into any approach must also be associated with the ADA vanity. 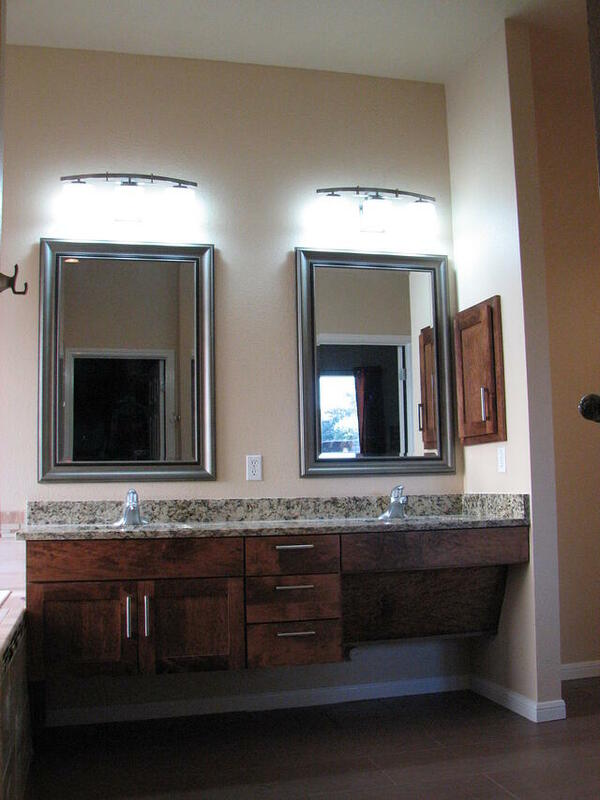 A 36x48" clear approach area to the vanity must be observed and this can overlap the five foot turning radius. The area of travel will then be enhanced by an unobstructed clear accessible barrier free route dedicated to reaching the vanity. Bathroom cabinets in Austin vary by style and usability. There are basically two styles of ADA bathroom vanities that comply with an unobstructed 27" tall roll under area below the sink. ADA sinks with a rear drain location provide for better plumbing drain hook ups. This modification has everything to do with both the water supply lines and the waste line connecting the sink. There must be provisions made to protect the user from being scalded when coming into contact with any one of the plumbing pipes serving the sink. These connecting pipes may become heated merely by the water passing through them creating the problem. The open type model should always receive both waste and supply insulating jackets applied directly to the pipes providing protection for the wheelchair user. The closed model concealing the pipes will be equipped with a removable face or face board covering the pipes. This pipe concealing panel must be installed at the correct wheelchair user clearance angle. This allows for the needed unobstructed legroom required for the user. The vanity can extend beyond the sink but the area containing the sink is required to have this roll under capability. This section of the vanity top must not be any taller than 34 inches above the finished floor with sufficient lower leg clearance. 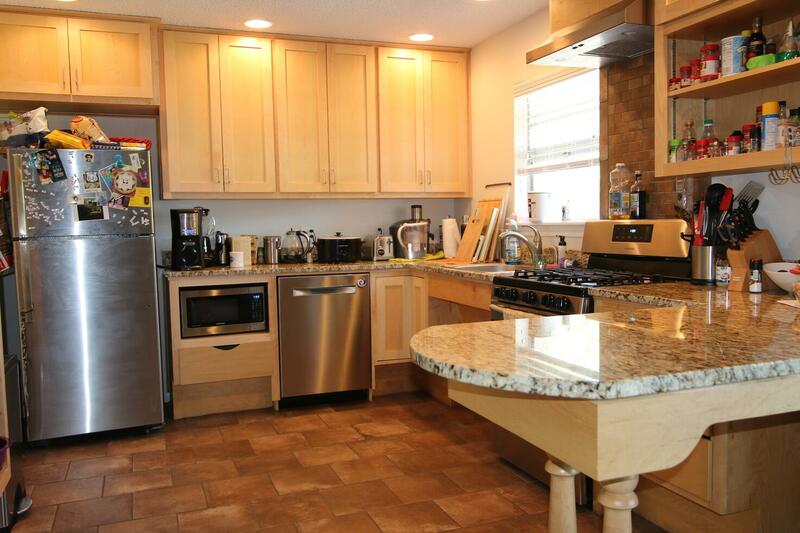 Clear unobstructed reach distances around the counter top area must be observed. Any motion controlled sensors integrated into the various dispensing devices and/or plumbing fixtures throughout the restroom present a true hands free benefit to all the restroom users. If these aren't in the budget then at least wrist handles used for controlling the faucet can be incorporated into the design of the vanity. Furthermore, automatic flush valves should be used on all toilets and urinals that provide for hands free use. Finding a contractor familiar with the guidelines of Elder construction and accessibility can be quite difficult. Be sure to check out the credentials of any potential bidders you contact. Be sure they understand that the alterations you are seeking are for wheel chair accessible home remodeling and modifications. Furthermore be sure this person knows and practices both the federal and most importantly your state's requirements before entering into any contract. When mobility becomes an issue for any homeowner, regardless of age, the question arises concerning physically moving to a different home with a bath that is more accessible. Preparing for one of those highly likely events involving someone in your home needing room modifications for even a short time while recovering from surgery is surely a smart move. Solving aging in place issues will soon become the number one challenge concerning the present obsolete housing inventory in our country. Our present day obsolete homes now inhabited by the baby boomer generation will slowly and increasingly raise their outdated and obsolete ugly heads and expose their true lack of kitchen or bathroom accessibility to those very people inhabiting them. The situation will only become ever more expanding in time. When these homes were previously purchased, they represented an absolute castle in the world of their owners in which to prepare for a day and they also acted as a retreat from life's tough interactions. They housed our families, our memories, and our stuff. They represented a place where we could be ourselves. Our homes have always been exempt from any and all of the accessibility regulations that have been put in place since 1968 when our Viet Nam veterans were returning home. The new evolving concept known as Universal Design and specialized handicap remodeling contractors for home remodeling is catching on nation wide and has been for several years as a sign of the times. Universal design techniques used in building makes a home more accessible to all regardless of their mobility or adaptive abilities. An evolution of new products used for disability home modifications is making those homes more accessible and has finally come about in the remodeling industry. These new advances in accessible home remodeling in Austin not only keep the living environments safer but will not compromise the home's aesthetics. In fact, there are many benefits to using universal design techniques, including potential use by aging family members, added resale value, and the fact that you'll be creating a space that can be used by anyone who visits your home, regardless of their range of abilities. Simple universal design updates for aging in place home modifications and handicap bathroom accessibility can include adding grab bars or handrails throughout the home, adding a seat within the roll in shower, lowering upper cabinets and counter tops, adding non-slip flooring, widening hallways or installing stair lifts, and widening doors. You might also consider lowering light switches and thermostats and installing easier to use door knobs. You should try to provide a clear barrier free path or accessible route to the most visited areas of your home as recommended by the ADA. The ADA is the Americans With Disability Act developed in the 1990's to be sure any person with a disability will have equal access to all public facilities and spaces. Unfortunately there are no restricted codes or regulations concerning residential bathrooms or disability access baths. However, these published guidelines for ADA accessibility concerning buildings and facilities is a great resource for ideas on how to make any home safer and easier to live in while aging in place. 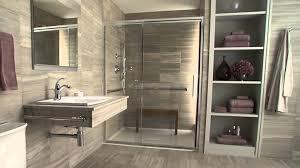 Homes can become more accessible through bathroom remodels to people as they age. Many of these published guidelines for wheelchair accessible remodeling, particularly requirements for corridor and door widths, safety bars and proper access to different types of facilities can go a long way in extending the amount of time an elderly or physically impaired individual can live independently. This is the primary basis for ADA remodeling. Many people find themselves needing accessible homes for themselves or family members. There are approximately 30 million Americans using wheelchairs and the number of people who need accessible homes will continue to increase as disabled and aging people are finding more ways to remain living in their homes. One important way to increase independent living is making a home accessible to an individuals personal needs. Home modifications can increase safety, accessibility, and independence for people who want to live independently. There are really three categories of aging in place customers. Those who are simply and wisely planning ahead for their futures to remain in their present homes. The second category concerns those people who know they have a chronic medical disorder and need to prepare in advance for accessibility issues which will come as a result of their disease. People with diseases that are constantly causing increased physical or mental changes to their being are a good representative of this second group. The third group involves those people who either have had a chronic problem that has progressed severely altering their mobility or those who have sustained a life altering tragedy such as being involved in an accident. All of these groups will drive the future metamorphosis of existing inaccessible dwellings. The goal of an accessible bathroom design in Austin is to make the bathroom a safe space for everyone who uses the facilities. Aging in place services use universal design to accommodate wheelchair use and can make the bathroom more comfortable for all generations with or without specific needs. It is important to carefully outline the scope of work during the remodeling of an accessible bathroom by first taking inventory of the users capabilities, needs, and preferences. All disability home remodeling or disability bath remodels in Austin must be done considering all the data provided by the client, his or her family, and any caretakers involved. Aging in place design must be carried out by an aging in place specialist. Roll in showers without curbs are advised for everyone on a universal level for an accessible bath. A 5'x5' clear floor space is an optimum size when a caretaker is involved. Using a 32-36" wide barrier free entrance in a shower partition with an out-swinging door is advised for everyone. Remember wider is better in all respects. Upon exiting the shower a clear floor space of 30"x48" for approach to the shower should be present and this area intersects with a five feet turning radius within the room. The shower should contain a shower wand on a sliding bar mounted at 48" above the floor to be available for varying heights of use accompanied by a regular height fixed shower head above. These diverse shower heads are both regulated using a diverting controller valve. Always use a shower valve that is thermostatically controlled and pressure-balanced to prevent scalds. If you desire a full body wash, you can include a regular shower head as well. Installing fixtures with a scald guard or lowering the temperature at the water heater is a must to prevent burns. Fold down seats attached to the shower wall are useful if caretakers are involved. Recessed shampoo niches are helpful to eliminate clutter on the shower floor. Secure grab bars installed on wood grounds buried within the wall around the entire shower perimeter at 34-36" above the finished shower floor increases the safety factor and helps to prevent falls. A recessed can light fixture should be installed above the shower area for proper lighting. All of the bathroom floor surface must be nonskid type to prevent slipping on a guaranteed wet floor. The ultimate goal in accessible design is to make the bathroom space safe for everyone who uses the bathroom. Universal design can better accommodate wheelchair users and can make the bathroom more comfortable for all users and many times can be done without sacrificing style. It is important to carefully plan the building or remodeling for a wheelchair accessible bathroom by taking inventory of the users capabilities and preferences. People who are interested in aging in place home improvements are now looking for a level entry into their home along with the maneuverability that a more open floor plan having greater clear unobstructed floor space presents. They desire flat floors without transitions requiring steps or stairs to move around. Ramps having a correct 1:12 slope can be used to get them up to the level floor space at the exterior entries or the garage access. ADA compliant kitchen cabinets and ADA bathroom cabinets will more than likely come into play to complete any accessible home remodeling project. Most aging baby boomers prefer one story homes in which to age in place and this has become a primary reason to relocate versus a remodel. They are looking for an accessible master suite and kitchen located on the same floor. However, some developments mandate building two story homes. The above requirement can be easily met by placing the guest bedrooms and accompanying bath upstairs. If the master suite for any reason needs to be upstairs, closets can be stacked between floors to house a future elevator installation. The National Association of Home Builders, in partnership with the AARP and Home Innovation Research Labs, created the CAPS program, which includes training and education on the technical, business management and customer service skills essential to compete in the fastest growing segment of the residential remodeling industry--home modifications for aging in place and ADA accessibility in Austin, Texas. David L. Traut, CAPS the owner of T-Square Company in Austin, Texas is one of the select group of professionals nationwide to earn the Certified Aging-In-Place Specialist (CAPS) designation, identifying him as a home remodeler and builder with the skills and knowledge necessary to remodel or modify a home to meet the unique needs of the older population, disabled owners, or their visitors. Falls and slips are among the most common causes of injury to senior and elderly people requiring disability access remodeling. Smooth surfaces in combination with wet areas make the bathroom one of the most dangerous areas within the home. It is of paramount importance that the bathroom be updated providing safety for any person with limited mobility or the elderly. If you are on a tight budget and can only afford a few modifications, the bathroom is the first place to begin an accessibility remodel. The most basic improvements like adding grab bars to enhance safety issues are fairly inexpensive. All new construction or any bathroom remodel should include an accessible shower with head combinations in multiple locations to fit anyone's desires. Incorporating universal design principles into your home's custom walk in shower design or one which is wheelchair accessible can facilitate aging-in-place goals, while comfortably addressing the diverse needs of all ages and mobility levels using your home. Rain heads coming out of the ceiling, body heads coming out of the walls in many locations, or hand held units attached to the shower walls can make things very interesting and relaxing. These combinations of heads and locations can be used to create rain effects, provide relief for muscle aches through body massages, or simply provide pin point convenience with hand held variable heads. The possibilities are endless as you dial in your bathing environment. Steam generators are also being considered as an investment in today's fine bathroom designs. The steam heads can make the difference after a tough day when you're looking for that more therapeutic spa experience. This has certainly led the way to the thermostatic shower valve with plumbed-in hand held shower that is being used specifically in homes today where the owner is planning to retire. Many people find themselves needing accessible homes especially in the bathroom or kitchen for themselves or family members. There are approximately 30 million Americans using wheelchairs and the number of people who need accessible homes will continue to increase as disabled and aging people are finding more ways to remain living in their homes. One important way to increase independent living is making a home accessible to an individuals personal needs which brought on the idea of wheelchair remodeling. Home modifications can increase safety, accessibility, and independence for people who want to live independently. Universal design and aging in place services in Austin have finally taken hold in the residential remodeling industry. The current housing inventory doesn't offer the features needed for safety and accessibility in the numbers needed to accommodate the growing demand. It is ultimately up to the homeowners and their families to plan for future housing needs. Our existing architecture does not lend itself well to accomplishing any easy aging in place home remodels in Austin. In fact, there are more inaccessible homes in all of the US than there are accessible homes and 45% of these existing homes are owned by the baby boomers representing the oldest group of homeowners. Generally speaking in most residential US properties there are no easy ways to enter into bathrooms or utilize kitchens without coming into contact with one architectural barrier or another-especially if a wheelchair or walker is being used to help with mobility issues. Everything requires the proper clearance and distance for a new customized accessible route in your home to function properly. Please consider this aspect in your design if an elderly parent will be coming to visit or you yourself suffer an unfortunate accident or develop a debilitating disease. Curbless roll in showers are advised for everyone involved in disability access bath modifications. The threshold is the most dangerous component for any ADA compatible shower. Not only is it impossible to overcome in a wheelchair but it isn't safe for those who are vision impaired or those with mobility issues. Curbless roll in showers that are 5 feet wide and 3 feet deep having a 36" clear entrance are recommended for everyone. Special low threshold shower bases with add on ramps can solve the shower entry problem when the floor cannot be lowered to form a true contoured roll in slope. The accessible shower should contain at least a shower wand on a sliding bar for varying heights of use along with a regular shower head and control valve if desired. Installing fixtures with a scald guard or lowering the temperature at the water heater is a must to prevent burns. Folding seats are useful if caretakers are ever involved. 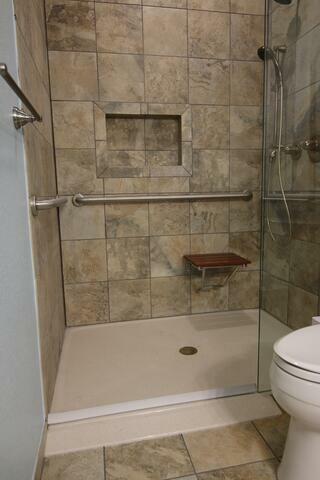 A low profile or roll in shower base will provide wheelchair or walker access. Grab bars around the bath and especially in the shower should be used while non slip floor covering should always be considered. There are currently at least 30 million Americans using wheelchairs and those numbers continue to increase as a large population of people with age related challenges look for ways to live independently in their homes. Remember, the bathroom can be one of the most dangerous places in your home because water is always involved. The bathroom can present many access challenges to people who use a wheelchair or need accommodations. Bathroom safety is one of the number one concerns in making a home accessible because more than 2/3 of emergency room visits are due to bathroom falls. Roll in showers without curbs are advised for everyone on a universal level for an accessible bath. A 5'x5' clear floor space is an optimum size when a caretaker is involved. Using a 32-36" wide barrier free entrance in a shower partition with an out-swinging door is advised for everyone. Remember wider is better in all respects. Upon exiting the shower a clear floor space of 30"x48" for approach to the shower should be present and this area intersects with a five feet turning radius within the room. The wheelchair accessible shower should contain a shower wand on a sliding bar mounted at 48" above the floor to be available for varying heights of use accompanied by a regular height fixed shower head above. These diverse shower heads are both regulated using a diverting controller valve. Always use a shower valve that is thermostatically controlled and pressure-balanced to prevent scalds. If you desire a full body wash, you can include a regular shower head as well. Installing fixtures with a scald guard or lowering the temperature at the water heater is a must to prevent burns. Fold down seats attached to the shower wall are useful if caretakers are involved. Recessed shampoo niches are helpful to eliminate clutter on the shower floor. Secure grab bars installed on wood grounds buried within the wall around the entire shower perimeter at 34-36" above the finished shower floor increases the safety factor and helps to prevent falls. A recessed can light fixture should be installed above the shower area for proper lighting. All of the bathroom floor surface must be nonskid type to prevent slipping on a guaranteed wet floor. The ultimate goal in accessible design is to make the bathroom space safe for everyone who uses the bathroom. Universal design can better accommodate wheelchair users and can make the bathroom more comfortable for all users and many times can be done without sacrificing style. It is important to carefully plan the building or remodeling for a wheelchair accessible bathroom by taking inventory of the users capabilities and preferences. Designing around specific physical conditions for handicap accessibility will lessen the impact of say arthritis, restricted mobility, or loss of vision by using combinations of products, concepts, and techniques available today. Working as a team, a trained CAPS specialist along with any family caretakers or therapists is able to identify the day to day problems weighing on those with health limitations. If you are considering an aging in place remodel for your home don't just contact any local remodeler in your area and expect a satisfactory accessible home modification. A professional design/build accessibility project can only be created for your specific needs by a qualified home remodeler having a nationally accepted CAPS (Certified Aging In Place Specialist) certification. This credential is backed by the NAHB. Only a CAPS home remodeler possesses the specific knowledge that will insure a successful outcome for your accessibility or aging in place project and what's more, keep you in your home longer. The National Association of Home Builders, in partnership with the AARP and Home Innovation Research Labs, created the CAPS program, which includes training and education on the technical, business management and customer service skills essential to compete in the fastest growing segment of the residential remodeling industry--home modifications for aging in place. David L. Traut, CAPS the owner of T-Square Company in Austin, Texas is one of the select group of professionals nationwide to earn the Certified Aging-In-Place Specialist (CAPS) designation, identifying him as a home remodeler and builder with the skills and knowledge necessary to remodel or modify a home to meet the unique needs of the older population, disabled owners or their visitors. Call us at 512-444-0097 to see how we can help you design your bath for the future. Life happens and your present way of going about it includes newly discovered physical barriers which were never an issue before. You've lost your mobility and are now forced to rely on a wheelchair for assistance at least for the present time. The maneuvering of familiar areas within your home you'd always taken for granted are now presenting barriers that are limiting your new means of mobility. Clear openings of 32" or greater, elevation changes steeper than 1:12, and being able to have access to all your home's facilities have been affected springing forth handicap remodeling. The removal of these home grown barriers that now disrupt your accessible route for handicap bathrooms in Austin, Texas needs to be done by a qualified building professional holding a CAPS certificate. Any ADA remodeling should comply with both ADA and local building code standards along with the TDLR guidelines. Problems encountered while accessing your home when you are wheelchair bound generally begin before or at the front door. Given that you can reach the front porch approach without obstruction is a great start. The stairs leading onto the front porch are yet another matter all together. A correctly designed ramp having the correct slope can adequately solve this problem. The use of grab bars and any railings will be dictated by the ramp's design and the regulations involved. Once your safely upon the porch, your home's front door width can become an issue. Any entry door less than three feet in width will cause a problem in maintaining a required 32 inch clear entry way that starts the new accessible route within your home. Once inside the structure a new set of problems concerning your accessibility will be discovered. An accessible bathroom for your convenience becomes the first issue. The disability access bathroom will be located within the accessible route. Any barriers encountered while approaching the bathroom entrance will need to be removed. The minimum clear widths have to be observed. This will include the bathroom door itself. Twenty four to twenty eight inch wide doors are commonly used during the construction of American homes for accessing the bathroom and must be widened during a bathroom transformation. Anything below three feet does not meet the clear 32 inch requirement mentioned above and will need to be altered for clearance of your wheelchair. This work may involve moving light switches. These alterations should be done by a licensed electrician assuring your safety. Once inside the accessible bathroom you should try to maintain a five foot turning radius for your wheelchair if at all possible. You will need to have your plumbing facilities brought into compliance to enable your freedom and safety. Bathroom modifications for the disabled involve the use of grab bars within the tub or shower and around the toilet which can be very helpful insuring your safety for maneuverability. These should be installed at 34 inches above the finished floor to safeguard your use of them. Having roll under capability for the new 34" high ADA compliant vanity can be very helpful while you are in the wheelchair. Exact clearances should be complied with underneath the vanity. The proper safety equipment should be installed on the plumbing pipes that don't allow scalding of your legs. The toilet may need to be replaced providing a comfort level height for easier access. The handicap bath or roll in shower may need to be altered to become only a shower with roll in or possibly transfer capabilities. Roll in showers are always easier to deal with than handicap baths having walk in ability. However, these tubs are not for everyone especially those with dementia so do your homework before buying such an expensive addition to your bathroom. All of these changes must be done along the ADA guidelines for your safety. Wheelchair Accessible bathrooms today contain stylish ADA vanities set at a universal height of 34 inches with clear knee spaces. Plan on 27 inches of vertical clearance for a wheelchair. The sink faucets must be easily controlled by either wrist handles or levers. The faucets can be fitted on the side of the sink to make them easier to reach. Or install infra-red faucets that detect motion. Hang the mirror low enough for a seated person to see themselves, and tip the top of the mirror out. Bathroom vanities with universal height cabinet tops and open knee spaces are taking over the marketplace. These new residential vanities do not need to look institutional. They can be designed like any other piece of fine furniture. Scalding must be guarded against by using either insulating pipe wrap or a removable panel for the plumbing. Toilets are available in comfort heights eliminating the deep knee bend needed for seating. Grab bars should be installed on at least both sides of the toilet. Ideally, the toilet should be positioned between two support bars 36 inches apart. A toilet seat 17 inches off the floor is a more comfortable height for everyone. Creating a toilet within an open area and not a closet is much more accessible. Elevated or special toilet seats are available with a heat feature and some have the ability to self close or have a night light. A more expensive bidet/toilet is available but an add on bidet attachment to a regular toilet can be handy. Curbless roll in showers that are 5 feet wide and 3 feet deep having a 36" clear entrance are advised for everyone. The shower should contain at least a shower wand on a sliding bar for varying heights of use along with a regular shower head and control if desired. Installing fixtures with a scald guard or lowering the temperature at the water heater is a must to prevent burns. Folding seats in the shower are useful if caretakers are ever involved and they are much safer than a free standing shower seat which can fall over. Grab bars around the bath and especially in the shower should be used while non slip floor covering should always be considered. Walk in tubs are also a consideration but some people get chilled while the tub is draining. Install the slider bar for the hand held shower hose and head 4 feet off the floor so that the head can slide up to 6 feet high. Always use a shower valve that is thermostatically controlled and pressure-balanced to prevent scalds. If you desire a full body wash, you can include a regular shower head as well. Always choose fixtures and fittings that are easy to control with a single hand motion or a closed fist. Motion controlled sensor fixtures are also a possibility when specifying finishes. Provide easily accessible storage compartments with pull out shelving eliminating architectural barriers by not using doors on the cabinetry. Always consider the individual needs of the occupant and find the best placement of any reachable items within their reach distance of 24". Fully consider where the best access is for all accessories such as robe hooks, towel bars, paper dispensers, soap dishes, toothbrush holders, shower shelves. The distances and clearances required will be dictated by the user and not by an accepted general outline. With falls in the wet area of the bathroom being such a great concern, a non slip tile floor should be installed without placing loose rugs in the general area. All doors should have levers instead of door knobs. 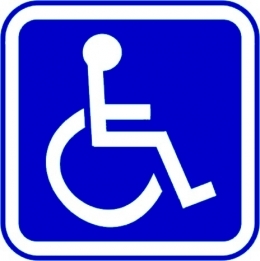 The Americans with Disabilities Act requires a 5-foot turning radius for a wheelchair. But if space is tight, remodelers may be able to make do with less. "(The 5-foor turning radius) may not always be needed, especially with an electric chair, which will easily turn in a tighter space. Natural lighting is always better for anyone using the bath. 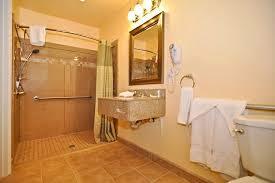 Adequate task lighting in the shower, dressing area, and vanity vicinity should be installed. Lowered switches at around 48" above the floor in reaching distance should control all the lighting. You can install switches with a push button or large toggle that doesn't require a pinching motion to turn on and off. Outlets that are ground protected should be installed at 18" above the floor. The referenced door situation above will be true for any room in the house if you are to enter them barrier free. The kitchen, your bedroom, and any other rooms you require accessibility to enter could be affected. Even the closet door within your bedroom will need to be wide enough so that you can manage getting your clothes to dress. Any other bedrooms that you may need to enter with your wheelchair will need alterations. The accessible kitchen is another story altogether. You will at least need the roll under capability as mentioned above at the sink. Upper kitchen cabinet heights may become an issue if you still plan to do meal preparations. No matter what you end up doing, make sure to hire an experienced building professional who understand the ADA guidelines for your well being. It's not for everyone, but as more and more older Americans choose to age in place and remain in their homes, issues related to maintaining mobility, promoting home safety and creating an environment to meet care needs are becoming increasingly important to both caregivers and care recipients. According to the AARP nearly 90% of older adults want to age in place and maintain independence however 85% have done nothing about it. Many retirees want to stay living in their own house for as long as possible. But being able to do so will depend on how easy it is to maneuver your home as you get older. Research by the Centers for Disease Control and Prevention show that aging in place home modifications may prevent up to 50% of home accidents among seniors in older homes including falls. When families are suddenly thrust into the responsibility of caring for an ill or injured family member, knowing how to make their homes accessible, barrier free and safe can be challenging. Even families that are savvy and experienced may have trouble figuring out whom to call for a roll-in-shower or door widening. The National Association of Home Builders, in partnership with the AARP and Home Innovation Research Labs, created the CAPS program, which includes training and education on the technical, business management and customer service skills essential to compete in the fastest growing segment of the residential remodeling industry--home modifications for aging in place. David L. Traut, CAPS owner of T-Square Company in Austin, Texas as a handicap remodeling contractor is one of the select group of professionals nationwide to earn the Certified Aging-In-Place Specialist (CAPS) designation, identifying him as a home remodeler and builder with the skills, training, and knowledge necessary to design and remodel or modify a home to meet the unique needs of the older population, disabled owners, or their visitors. Home modifications for aging in place should include adding non-slip flooring, widening hallways or installing stair lifts, and widening doors. You might also consider lowering light switches and thermostats and installing easier to use door knobs. Many considerations for an aging in place design should be taken into account to provide safety and independence. You should try to provide a clear barrier free path or accessible route to the most visited areas of your home as recommended by the ADA. The three areas needing improvement for a person wanting to age in place include the bathroom, the kitchen, and the family area in order of importance. People who are interested in aging in place services and aging in place home improvements are now looking for a level entry into their home along with the maneuverability that a more open floor plan having greater clear unobstructed floor space presents. They desire flat floors without transitions requiring steps or stairs to move around. Ramps having a correct 1:12 slope can be used to get them up to the level floor space at the exterior entries or the garage access. ADA compliant kitchen cabinets and ADA bathroom cabinets will more than likely come into play to complete any accessible home remodeling project. Let's compare the alternative costs associated with aging in place verses when you already own your home. The more institutional alternative of assisted living accompanied by more medical expertise and staff training plus the access to emergency medical facilities is available as opposed to renting an apartment. These are two of the main alternative choices for seniors who decide not to remain in their own homes. According to a national study done in 2014, the average cost for assisted living ranged from $3,000 to $3,500 per month. However, if you decide to age in place in a high quality one bedroom apartment, the rent will run around $1,300 per month. Living in your own home or with loved ones represents a preference by most seniors and property taxes must be taken in account. An average Aging in Place master bathroom home modification providing total accessibility given there is a large enough space to remodel at onset will come in around $30,000. This can vary in many aspects if there is not enough room to change the existing floor plan. Smaller bathrooms can cost $15-20,000 but will not have the barrier free accessibility as the larger modified bathroom. Fully accessible kitchens will run on the average of $50,000 depending on the size of the existing kitchen. These are both one time costs for sustainability of a given lifestyle and location providing future independence and safety for the homeowner who participates in accessible home remodeling. All disability home remodeling or disability bath remodels in Austin must be done considering all the data provided by the client, his or her family, and any caretakers involved. Aging in place design must be carried out by an aging in place specialist who is also a reputable residential remodeling professional. The goal of an accessible bathroom design in Austin is to make the bathroom a safe space for everyone who uses the facilities. Aging in place services and Elder construction techniques use universal design to accommodate wheelchair use and can make the bathroom more comfortable for all generations with or without specific needs. For additional information about the CAPS program, visit nahb.org/CAPS. For more information about T-Square Company, visit www.tsquareco.com or call 512-444-0097 to schedule a home consultation by a registered CAPS professional. Universal Design does not equate to accessibility design even though they both are concerned with ergonomics and human function issues. The ADA guidelines for accessibility were created as a means to help those people with extreme disabilities within our society who are a narrow and specific cross section of the masses. A UD approach broadly takes into account moderate impairments or disabilities, temporary health conditions, and the varying abilities of anyone within a home regardless of their age or size. In other words, an ADA accessible home would be designed specifically for the one person with the disability whereas a UD home is designed for everyone. No matter how old you are you should periodically evaluate your residence to determine whether it suits you not just for the present but the future. Your home assessments will be rethought every time your living situation changes. Whether childproofing for a newborn, making a home more accessible following a sickness or unfortunate accident to someone in the family, or making a toilet area safer for an aging residing parent, there will be an immediate evolution to your primary domicile. These same life span design features are even more important if you believe you're past the age of wanting to move and are relishing the thought of aging in your own home, no matter what physical limitations you might later develop. Incorporating smart aging design concepts through universal design build ideas throughout a home will attract a larger group of buyers when you decide to finally sell your home. Everyone has special needs and there is no one size fits all solutions using universal design. A twenty five year old homeowner with a bad back is really not similar in needs to his or her aging eighty year old grandmother, although they both need added accessibility only in different but similar ways. Kitchens have evolved because fewer cabinets are needed within the more open designs using Universal Design techniques. Fewer wall cabinets are needed because of personal reach limitations. For those that are used, they can be installed at 14" above the base cabinet work top instead of the standard 18" spacing. Dishes can be stored in specialized pull out shelves. Pull down upper shelving is available but can be very costly. The cabinet top is now lowered by two inches and installed at a universal 34" height. This makes a net 6 inch lower installation height for the bottom of the wall cabinet from the floor. All types of cabinet inserts like pull out shelves, lazy Susans, and specialized drawers are now available for installation in both base and wall cabinets to increase accessibility. These devices will certainly help solve the reach problem. Base cabinet kick spaces can be raised to 9" and deepened to 6" instead of the standard 4" to accommodate future wheelchair access. Recessed knee spaces can be incorporated into the design for roll under access at the sink, prep area, and cook top. A shallow cabinet with doors can be creatively installed in these areas disguising their intended future use. The lack of bending motion and ever decreasing reach distances is changing the way we purchase and install appliances at comfortable heights. Placing dishwashers higher by a few inches to limit bending has become a reachable fad and the new height is changing the old look of our kitchens. Refrigerator or freezer drawers, dishwasher drawers, and double ovens that are no longer stacked represent just a few changes within the present day appliance marketplace. The ovens can be installed at the height the homeowner finds most comfortable. Cooking ranges and cook tops with the controls located on the front represent another metamorphosis helping with reach problems. Microwaves can be installed onto the now lowered 34" height counter top or preferably within the upper area of the lowered base cabinet according to the consumers need for adequate reach. The refrigerator should be a cabinet depth french door model giving access to the lower freezer and maybe an additional refrigerated drawer. Raising the dishwasher up at least 6" can be very helpful for access if you choose to use a conventional model. Fewer doors represents a change in the cabinet market. The new open look lets homeowners access what is stored within the cabinet without an open door blocking their clear path for approach. No matter in what manner the doors are hung they always interfere with accessibility if they swing. They will become architectural barriers within the home at some time. Sliding doors are an option but can become a problem if dexterity and coordination ever become an issue. The open cabinet look is seen in both the bath and kitchen as the open shelves make it easier to find the items you need. If a more structural look is needed then glass fronts can be installed. The glass doors maintain the feeling of openness but with order. The space between cabinets in a "C" or "U" configuration should be between 42-48" for wheelchair access. A 60" turning radius should be observed for a wheelchair turn if entirely possible within a larger kitchen floor plan. Cabinet hardware should be considered for the future. Small knobs can be a problem for people with arthritis. Graspable "D" handles are a better option. The larger the pulls the easier it is for everyone to use. 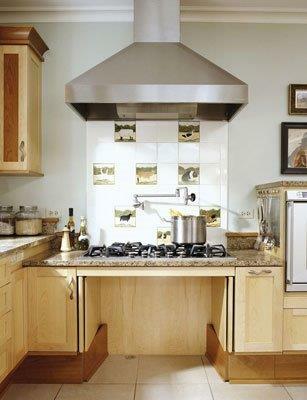 Cabinet tops at varying heights should be installed using universal design. A lower island top can become a work surface for someone seated or a six year old helper. This area can be sectioned off using a higher 42" top used for bar stools. Cabinet top materials must have eased edges at the angles to prevent injury. The choice of materials you use for your cabinet top must be both durable and easy to maintain. All disability home remodeling or disability bath remodels in Austin must be done considering all the data provided by the client, his or her family, and any caretakers involved. Aging in place design must be carried out by an aging in place specialist who is also a reputable residential remodeling professional. The goal of an accessible bathroom design in Austin is to make the bathroom a safe space for everyone who uses the facilities. Aging in place services use universal design to accommodate wheelchair use and can make the bathroom more comfortable for all generations with or without specific needs. For additional information about the CAPS program, visit nahb.org/CAPS. For more information about T-Square Company, visit www.tsquareco.com or call 512-444-0097 to schedule a home assessment by a CAPS professional. Knowledgeable construction and design professionals are utilizing their CAPS training across the nation. CAPS stands for Certified Aging In Place Specialist. This designation is taught through the National Association of Home Builders in collaboration with AARP. CAPS connects responsible professionals with home owners who need these services on an ever-increasing basis. CAPS is a nationwide initiative and all active CAPS members can be found at nahb.org/CAPSdirectory. The first thing you can do in making your home more age friendly is to do a self assessment. Go through your house identifying known problem areas like potential tripping or slipping hazards, as well as areas that are hard to access and difficult to maintain. Who would be better at pointing out problem areas than the person who is needing the home modifications according to their known physical condition. To help with this, there are several organizations that have aging in place checklists pointing out potential problems in certain areas of the home suggesting modification and solutions. Once you have completed your initial aging in place checklist it is time to bounce your findings off a trained aging in place specialist. Next, contact a builder who is a listed Certified Aging in Place Specialist (CAPS). CAPS are home remodelers and design-build professionals that are certified and knowledgeable about aging in place home modifications. This CAPS professional can suggest ways to modify or remodel your home that will fit your needs and budget. CAPS are generally paid by the hour or receive a flat fee per visit or project. During a home assessment for increasing accessibility the structural needs of the client will be noted and documented through sketches, photos, and conversation by a registered CAPS professional. All the surroundings will be taken into account from the flooring to the layout of a specific room or location as it pertains to the inhabitant's ease of usability. The physical and emotional needs of the occupant will also come into play because of mobility, sensory, or cognitive concerns. Each individual with similar impairments describes his or her limitations differently when undergoing elder construction. The blind don't experience their world the same as a person with deafness. The ultimate goal is to modify the home in a custom manner to provide for the maximum health, independence, and safety of the occupant. Often the input from any caretakers like a physical or occupational therapist during the assessment phase can prove to be invaluable. The three main rooms involved in aging in place home modifications are the bathroom, the kitchen, and the family room in that order. These areas make up the most occupied spaces of any home and will be connected by a designated accessible route. The basic needs involve access through wider doorways, non slip floor surfaces, and adequate cabinet and plumbing fixture accessibility. What is more important is that we must observe safety for everyone as the baby boomers choose to age in place within their homes. For more information about T-Square Company, visit www.tsquareco.com or call 512-444-0097. There are really three categories of aging in place customers. Those who are simply and wisely planning ahead for their futures to remain in their present homes. The second category concerns those people who know they have a chronic medical disorder and need to prepare in advance for accessibility issues which will come as a result of their disease. People with diseases that are constantly causing increased physical or mental changes to their being are a good representative of this second group. The third group involves those people who either have had a chronic problem that has progressed severely altering their mobility or those who have sustained a life altering tragedy such as being involved in an accident. All of these groups will drive the future metamorphosis of existing inaccessible dwellings. In designing for specific physical conditions, we realize that aging doesn't always bring on disease while the body declines making certain physical limitations inevitable. Arthritis is the most common chronic condition to appear as it restricts ordinary daily activities. The lack of hand strength and stiff knees are indicative of this illness. This most reported arthritic condition affecting people over the age of 65 is followed by heart disease and vision loss in that order. Smart aging design and concepts can compensate for the introduction of frailty, lack of mobility, and blindness in aging in place families. We are constantly coming up with new methods for home modifications and household products to increase the comfort of our residential environments. David L. Traut, CAPS the owner of T-Square Company in Austin, Texas is one of the select group of professionals nationwide to earn the Certified Aging-In-Place Specialist (CAPS) designation, identifying him as a home remodeler and builder with the skills and knowledge necessary to remodel or modify a home to meet the unique needs of the older population, disabled owners, or their visitors. We offer a complete line of aging in place services. Aging in place design, construction, and remodeling has become synonymous with accessible home remodeling during our lifetime. Home modifications can be used to accommodate anyone from people with mobility impairments to those with vision loss, hearing loss, or even cognitive or developmental disabilities. A revolution in building design standards is long overdue in Austin. Our current building design standards do not address the needs of more than one third of our existing population. Many more people can greatly benefit from accessible design versus conventional design. Our rapidly aging population is experiencing the limitations of our personal living environments. Any evolution in building practically always begins in the common areas of the commercial building sector. The American Disabilities Act of 1990 increased the attention needed for those people having the right to equally access their work place and any recreational or leisure facilities. These rules at least offer minimal solutions for those needing the most help with any building access. We now must provide access to one bathroom on the first floor in new homes as deemed by our newly adopted building regulations. This basic right to an accessible bathroom is finally being enforced by the city building inspectors. What a tremendous needed and basic design improvement! This change in thought works great for new home owners but what about our existing inventory of older homes and their occupants? Elder construction most definitely falls under the category of aging in place. People are living significantly longer with the advent of specialized medicine, care, and a healthier lifestyle. The Center for Disease Control defines aging in place as the ability to live in one’s own home and community safely, independently, and comfortably regardless of age, income, or ability level. Aging in place construction and remodeling has become synonymous with handicap accessible home design and modification during our lifetime. Home modifications can be used to accommodate anyone from people with mobility impairments to those with vision loss, hearing loss, or even cognitive or developmental disabilities. Accessibility home modifications or wheelchair accessible kitchen and bathroom remodeling in Austin will allow anyone with limited mobility within your home to feel more empowered and independent. The extent of a customized accessibility design is dependent upon the activity level of the person requiring the modifications. Whether someone needs a cane, walker, or wheelchair to help with mobility it is definitely a game changer for accessibility within the home. Aging in place home modifications help people maintain their living environment for as long as it works for them before they might need assisted living care or a nursing home. Many people find themselves needing accessible homes for themselves or family members. There are approximately 30 million Americans using wheelchairs and the number of people who need accessible homes will continue to increase as disabled and aging people are finding more ways to remain living in their homes. One important way to increase independent living is making a home accessible to any individual personal needs. Home modifications can increase safety, accessibility, and independence for people who want to live independently. Falls and slips are among the most common causes of injury to senior and elderly people. Smooth surfaces in combination with wet areas make the bathroom one of the most dangerous areas within the home. It is of paramount importance that the bathroom be updated providing safety for any person with limited mobility or the elderly. If you are on a tight budget and can only afford a few modifications, the bathroom is the first place to begin an accessibility remodel. The most basic improvements to enhance safety issues are fairly inexpensive. Disability is a complex phenomenon representing an interaction between one's physical impairments, the activities they need to perform, and the architectural barriers within the space in which this situation occurs. The terminology and jargon used for disabilities evolves regularly whereas, "handicapped" is no longer acceptable. It is no longer merely a description of intellectual or physical impairments. Each individual with similar impairments describes his or her limitations differently. The blind don't experience their world the same as a person with deafness and so on. Physically challenged has become the more socially accepted description of a person with an impairment. No matter how old you are you should periodically evaluate your residence to determine whether it suits you not just for the present but the future. Your home assessments will be rethought every time your living situation changes. Whether childproofing for a newborn, making a home more accessible following a sickness or unfortunate accident to someone in the family, or making a toilet area safer for an aging residing parent, there will be an immediate evolution to your primary domicile. These same life span design features are even more important if you believe you're past the age of wanting to move and are relishing the thought of aging in your own home, no matter what physical limitations you might later develop. Incorporating smart aging design concepts like a roll in shower into a home will attract a larger group of buyers when you decide to finally sell your home. Preparing for one of those highly likely events involving someone in your home needing room modifications for even a short time while recovering from surgery is surely a smart move. Solving aging in place issues will soon become the number one challenge concerning the present obsolete housing inventory in our country. Finding a contractor familiar with the guidelines of accessibility can be quite difficult. Be sure to check out the credentials of any potential bidders you contact. Be sure they understand that the alterations you are seeking are for wheel chair accessible home remodeling and modifications. Furthermore be sure this person knows and practices both the federal and most importantly your state's requirements before entering into any contract concerning Austin accessible home remodeling. The total assessment of any situation involving increased accessibility requires the input of the qualified building remodeler and any caretakers or family members who are involved with the person requiring the home modifications.